Predictive Analytics World for Business is heading to Las Vegas, NV on June 3-7, 2018 and we're excited about the stellar speaker line-up, a diverse array of industry leading professionals. Predictive Analytics World for Business is heading to Las Vegas, NV on June 3-7, 2018 and we're excited about the stellar speaker line-up — here are some details. 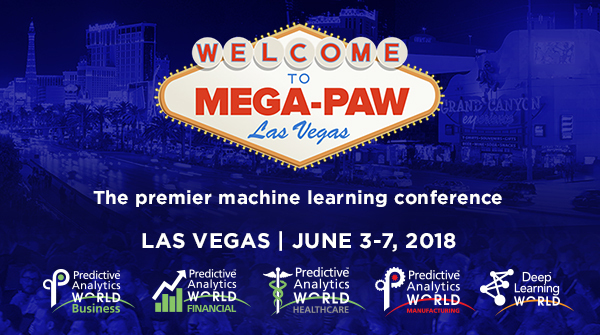 PAW Business takes place at Mega-PAW alongside four other conferences: PAW Financial, PAW Healthcare, PAW Manufacturing, and Deep Learning World. Cross-registration options are available for all access.